"I watched through the front windshield as we followed 20 black cars, Escalades and ambulances down the Island’s windy one-lane roads." I woke up before my alarm clock on the morning I was supposed to photograph the President. I stared at the ceiling, wishing I could close my eyes for the next half hour and actually fall asleep. I couldn’t. I rolled back my comforter and sat on the edge of the bed. I brushed my teeth, got dressed and packed my backpack for the day: notebook, pens, earphones, laptop, charger. It was going to be a long day. I put my camera in last. I had cleaned its two lenses carefully the night before. If I was going to photograph the President, it had damn well better be a clean shot. On the drive over to meet up with the White House press pool, I convinced myself I was ready for the day ahead. In less than an hour, I’d be in a van with the big shots — reporters and photographers from the New York Times, the Wall Street Journal, Bloomberg, the Associated Press, Reuters and other major national news outlets. They had all flocked to the Island of Martha’s Vineyard — a place I had called home for the last several months — to follow President Obama on his summer vacation. As a reporter for the Gazette and a member of the press pool, my job on this day was to take pictures and send reports of the President’s activities to a press assistant, who would then forward them to a list of other journalists. I worried what the vets would think of me, the country bumpkin of the crew. I wondered if they would be able to tell I was still a teenager. I imagined them noticing the lucky belt I was wearing — a tacky bright green with shamrocks on it — and pulled the end of my shirt down a little bit lower. We drove, first in a yellow coach bus and then in black and silver vans, to a holding area, where the presidential motorcade was parked. State troopers and Secret Service agents walked the grounds. I was filled with anticipation. The Secret Service patted us down and instructed us to place our backpacks and possessions on the ground in a line. I watched as an agent picked up my camera. He looked through its lens at his co-worker and smiled. Even with my zoom lens on, the magnification was far weaker than what he was accustomed to. I pictured him peering through the scope of a rifle and wondered what he’d seen. Soon, we got word that President Obama was ready to hit the road. The White House press assistant warned us that we were not allowed to know where we were going. When we arrived someplace, the “press wrangler,” as she called herself, would email us the name of our location. If anyone outside the White House were to know the President’s destination in advance, it would compromise his safety. The mystery tour was part of the day’s intrigue. Unlike the other reporters, I was well acquainted with the Island’s geography and always had some sense of where we were traveling. Though not truly a local, for one day I felt like one. I watched through the front windshield as we followed 20 black cars, Escalades and ambulances down the Island’s windy one-lane roads. I was riding in the presidential motorcade — it was surreal. I sent the report out and waited for a copy of it to return to my inbox. Meanwhile, I gazed at the van’s speedometer, hoping to catch it exceeding the speed limit. I was disappointed to discover that it rarely did. 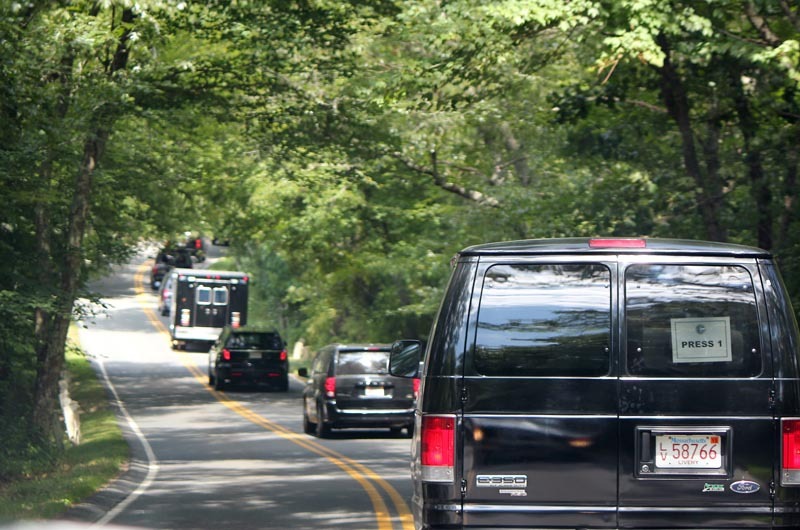 I’d always pictured the motorcade zipping by at whatever speed it desired. After a short drive, we arrived at a golf course. The journalists in my van rolled their eyes. The reporters hated it when Obama played golf because it meant we’d be sidelined for hours — no one was allowed on the links. I listened as the others validated this sentiment. Would that be my attitude one day, too? In the moment, I was still fascinated by the fact that the Secret Service agents weren’t dressed in matching uniforms — they didn’t even wear aviators. After the President finished his round of golf, we still had no information as to where we would go next, or how long it would take. We only knew that the day would end with a trip to the airport; the President had to fly home for a special meeting the next morning. I selfishly hoped the President would travel somewhere where I could see him. I wanted that shot. When we arrived at an outdoor jazz performance, I was hopeful, but we were quickly told to stay in the parking lot. The President and his wife left the festival to have dinner at a fancy restaurant in town. We ate pepperoni pizza on the sidewalk and waited. We parked on the tarmac and the press assistant told us where to stand. We’d have a very short time frame to photograph the President. It was 10:45 p.m. and he was running behind schedule — there was no time to smile and wave. I waited eagerly for my chance to see the President for the first time. I wanted to slow down the moment. As I waited for him to leave his car, I took photos of the tarmac and the tail of Marine One. One of the journalists stood behind our van on the edge of the airfield. I couldn’t believe it — she was on her phone. Here we were, watching the President board Marine One, and something on her screen was more fascinating. While I waited for the President, I turned to take a picture of her, the jaded veteran journalist, totally indifferent to the moment I was so hyped for. In some ways, that had become more representative of my day than the pursuit of the President himself. Seconds after I pressed my camera button, the President exited his vehicle. It could not have been worse timing. I swiveled quickly to get a shot and watched the back of his head through my telephoto lens. The low light conditions required a slower shutter speed (and very steady hand). I knew, without wanting to know, that Obama was inside the helicopter before the shutter fully closed. The picture was terrible. I blew it by being preoccupied with the uninterested journalist. On the ride back to my car, I reviewed the photos I had captured, hoping that at least the jaded journalist registered clearly through my lens. I was bummed but not surprised that the picture was blurred and unremarkable. I reassured myself on the drive home. So what if I didn’t have hard evidence? I’d still seen the President in person and it could be a long time before I can say that again. I’d been a part of the press pool. I rode in the presidential motorcade with the big shots and got a window into their world. I sent out reports to journalists throughout the state. Maybe some of them even read my name. Three days later, while sitting at my desk, I got a text from my dad, who had gone golfing. Attached was an image of President Obama on the putting green. Effortlessly and by total coincidence, my dad had gotten a far better shot than me. No press pass, no waiting in a big yellow bus all day, no planning or nerves or anticipation. I smiled at the peculiarity of it all and revisited my two pictures from the tarmac. Though compositionally weak, underexposed and totally unfocused, I decided I liked them better. A story walked through them. Meg Robbins worked as an intern at the Gazette this summer. She is a sophomore at Bowdoin College.